Businesses with unique and high value technical equipment and assets are dependent on the constant availability of critical operating resources. 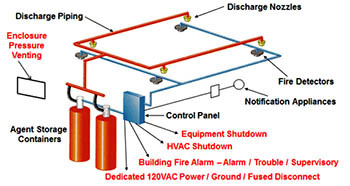 You have to rely on your fire protection system to minimize costly business interruption. Protect assets and save valuable floor space. Minimax provides a range of clean agent detection and delivery systems to meet the needs of virtually every application. Our exclusive high pressure 725 psi MX-1230 and MX-200 systems allow for higher flow rates, smaller pipe diameters, and the longest possible pipe runs of any chemical agent system. You no longer need to locate tanks near the protected area, freeing valuable floor space previously dedicated to more limited suppression systems. In addition, higher pressure means smaller tank sizes and overall cost savings on system installation. The optimal Halon replacement solution. 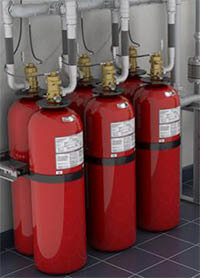 Minimax high pressure 725 psi systems are the ideal answer for retrofitting ozone-depleting Halon systems. By simply changing nozzles and cylinders, and often with minimal pipe changes, Minimax can provide the most cost-effective and secure solution for Halon replacement. 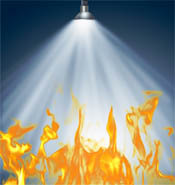 FM-200 provides excellent fire protection in a wide range of applications from sensitive electrical equipment to industrial applications using flammable liquids. FM-200 is ideal for applications where clean-up of other media presents a problem, where weight versus suppression potential is a factor, where an electrically non-conductive medium is needed and where people compatibility is necessary.